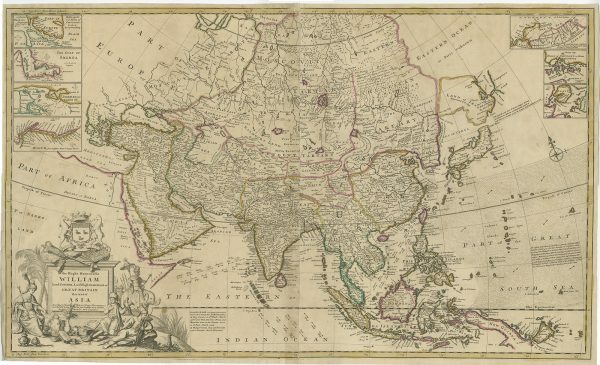 Antique map of Asia by Moll titled ‘To the Right Honourable WILLIAM Lord COWPER, Lord High CHANCELLOR of GREAT BRITAIN. This MAP of ASIA……………..Servant Herman Moll Geographer’. A very fine and rare large map of Asia compiled by Herman Moll (c. 1654-1732) that was eventually published in his large-folio World Atlas or the World Described in London in 1717. The atlas consisted initially of 25 mostly two-sheet maps of the world and its regions which were sold individually from 1707 onwards and assembled in completed atlas form in 1717. This map was not bound into an atlas and was sold as a separate two-sheet map. The map contains seven insets of important areas in Asia including the River Hugly, the Gulf of Smirna, Bombay, the Hellespont, Quemoi, Chusen and Nova Zembla. Measurements: 640 x 1020 mm. Condition: Good, with outline colour, slightly toned.